It was an outburst of emotions as thousands of people gathered to bid farewell to the acclaimed father of Christianity in Bokkos LGA, Plateau state, Late Rev. Col. John Mashem. Many people who attended the funeral expressed pain at his departure giving his impact in their spiritual lives. His wife, Mrs. Juliana Mashem specifically referred to him as a friend whose main concern was the recruitment of many including his children into the service of God. Through his influence coaching, his son, Rev. 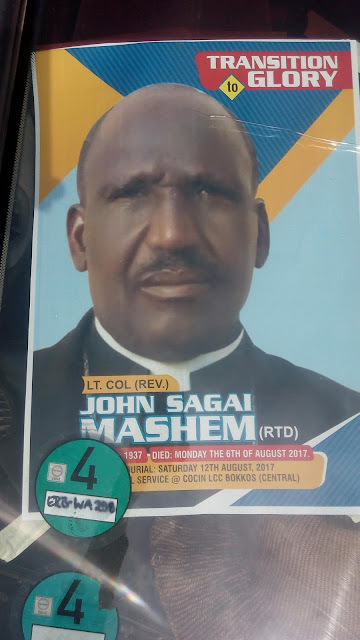 Yakubu Sagai, the head pastor of the COCIN Headquarters Church, Jos joined the ministry, one thing the COCIN President, Rev. Dr. Dachollom Datiri, through his vice, Rev. Dr. Obed Dashan expressed joy about. The late Rev. Mashem had served the church in different capacities including operating the church at the warfront under the Nigerian Army Chaplaincy during the civil war. He passed on in the early hours of August 6, 2017 after a prolonged illness shortly after burying his brother, Mallan Sagai. The Vice Chairman of COCIN RCC Bokkos, Rev. Yunana Maphiof reading from Psalm 116:15 in a sermon saw this as the only way he could have claimed his inheritance in heaven. No one who lives an unrighteous life, said Rev. Maphiof ever claims anything in heaven. There death, he observed is worthless before God. The records and testimonies of the deceased clergy are however an assurance that he has transited to glory, Rev. Maphiof said.